Clams are often prepared steamed in white wine and aromatics like garlic, but I think clams cooked in tomatoes aren’t given enough attention. The combination of briny clam juice with acidic and sweet tomato soup is just phenomenal. 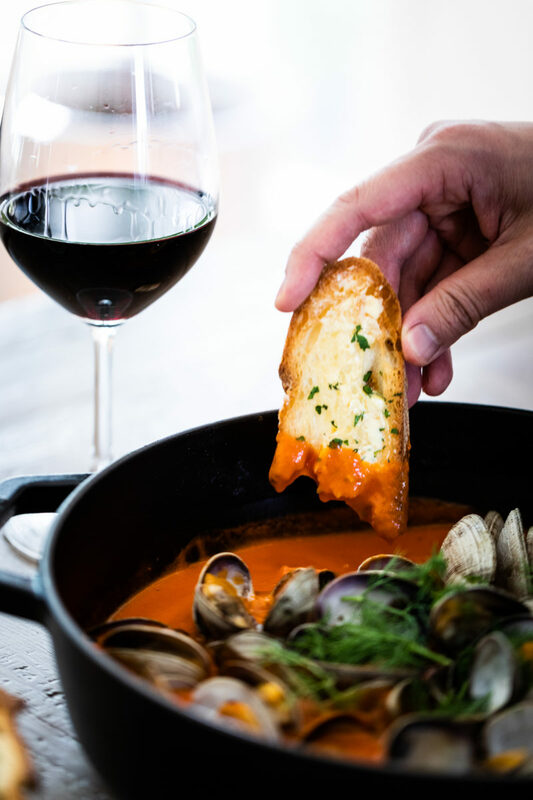 Think of the flavor like a kind of simplified cioppino– the broth is deep with flavor but finishes with a briny sweet lightness that is so good. 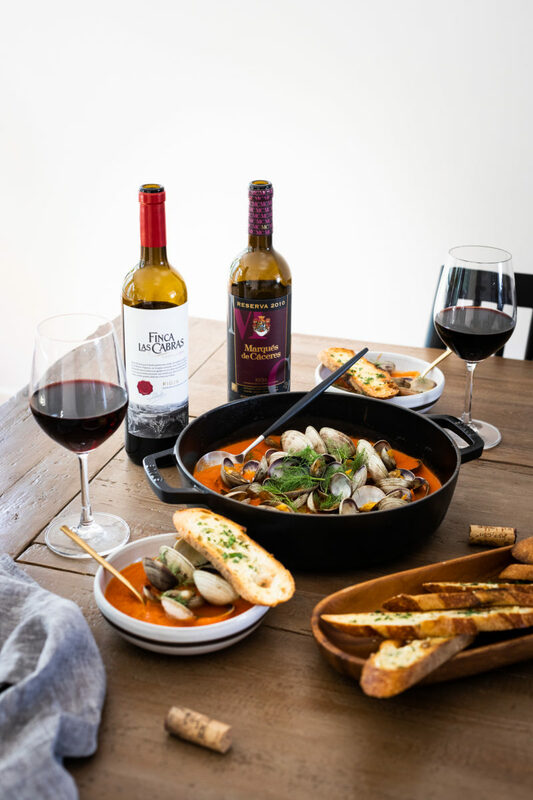 These bold flavors are best paired with a complex and hearty red wine like Rioja, which hails from Spain’s most historic wine region. I’m featuring this dish with two excellent wines from Rioja, one from Las Cabras and another from Marqués de Cáceres. 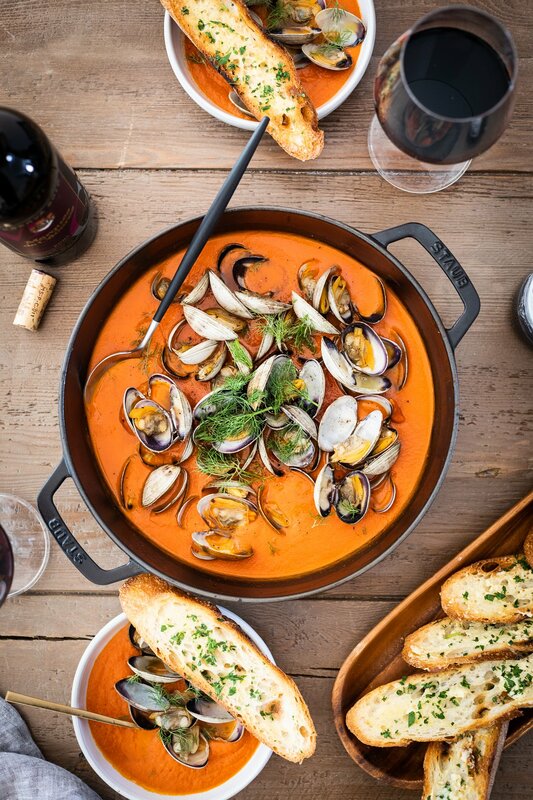 Wines from this region have the right level of acidity and subtle flavor to enhance this dish and not overpower it. 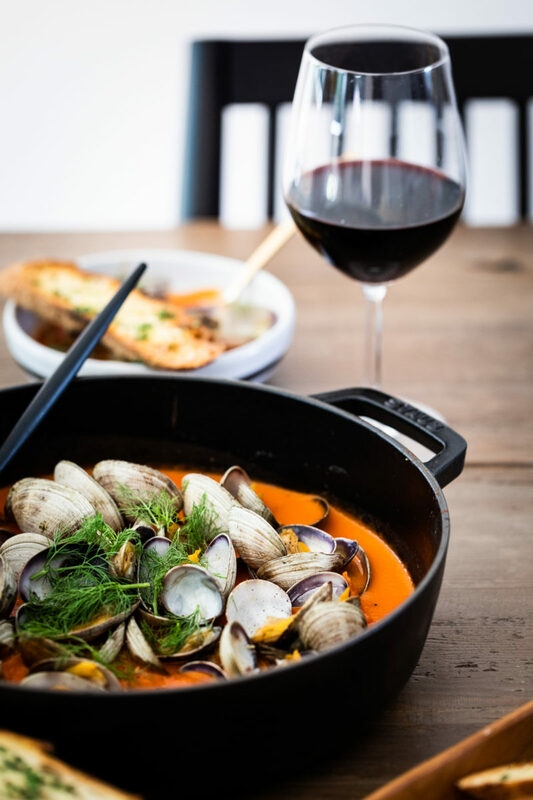 A large pot of these clams with a bottle or two of Rioja wine makes for the perfect date night in! (images by HonestlyYUM. 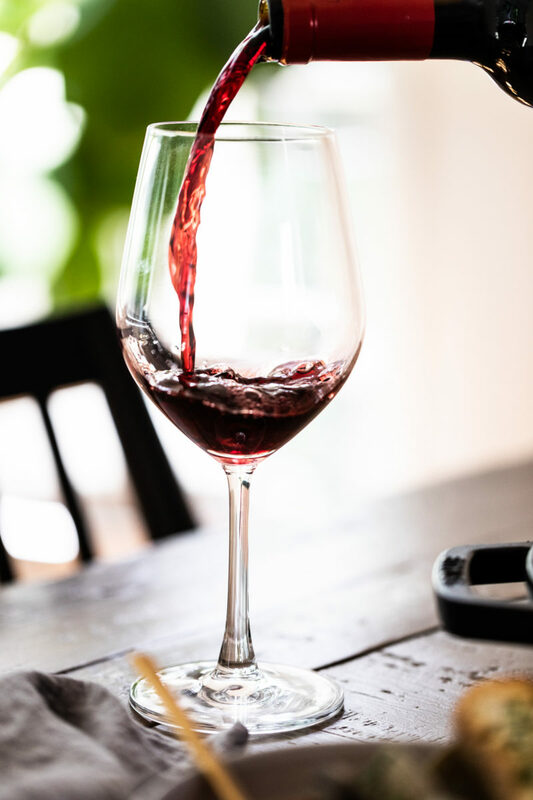 This post was created in collaboration with Wines of Rioja. In a Dutch oven or large pot, saute the onion, fennel and garlic with the butter until the vegetables become soft (about 10 minutes). Add the red pepper flakes and saute the vegetables for a couple more minutes. Add the tomatoes and 1/4 cup of water. Simmer over medium-low heat for 15-20 minutes covered with a lid. In another medium size pot with a lid, heat the pot over high heat and add the mirin. Quickly add the clams. Cover with a lid and cook for about 6 minutes until all the clams have opened. Discard any that have not opened. 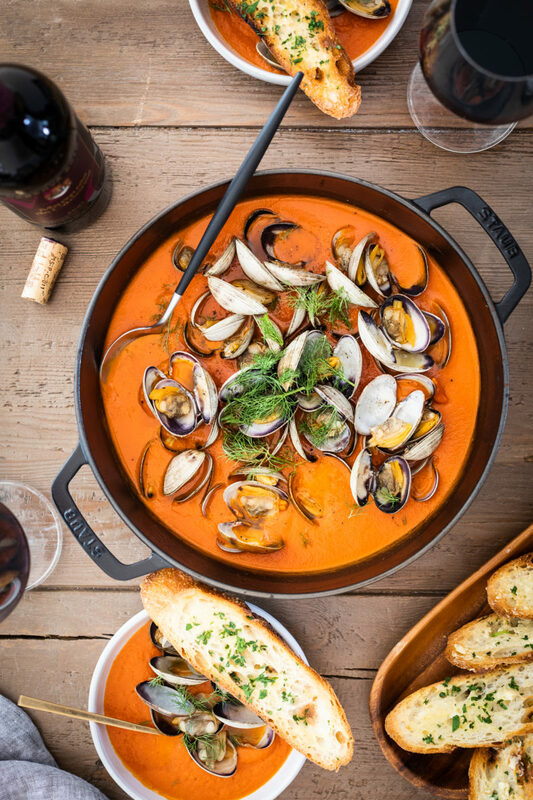 Transfer the clams to a separate bowl or plate and add about 1 1/2 cups of the clam juice to the pot of tomato sauce simmering. If you don't have enough you can add water to get enough liquid to reach the right consistency. Mix to combine and transfer to a blender and blend until smooth. 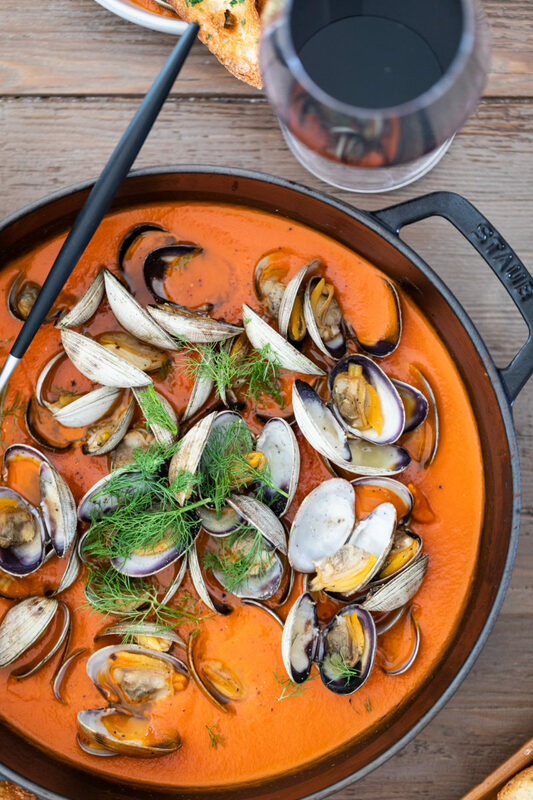 Pour the smooth tomato soup through a sieve back into the Dutch oven and add the clams back in. Garnish with some fennel fronds and serve with bread and lemon wedges.